Maple water. Have you heard of it? Maple water is maple tree sap. Unlike what you may think of as tree sap that is thick and sticky, maple tree sap is thin, watery – and full of natural sugars and nutrients. It’s what yummy (real) maple syrup comes from, that you pour over your pancakes and waffles in the morning. My family and I ventured to to tap some of the maple trees on our farm as a homeschool project. It quickly became a more involved project than I had anticipated or planned. After harvesting the first batch of maple sap from our trees, we aborted our plans in the kitchen after a few hours as we belatedly realized that boiling down (reducing) the sap on our stove would take the rest of the afternoon – and probably a few more afternoons after that! It turns out that getting the sap from the trees in the spring is only the beginning of a long process of turning maple water into maple syrup, maple sugar, and maple candy. Commercial sapping operations have huge evaporating stoves. Many more modern operations use a reverse osmosis process to remove most of the water from the sap, leaving just the sugary maple syrup or crystals behind. Thankfully one of our neighbors stepped in and gave us a hand with the rest of the sap. We had tapped many of the maple trees on our property and didn’t want all that time, effort and fresh sap to go to waste. So, other than maple syrup, what else can maple sap be used for? Lately in many health food circles, coconut water is all the rage. Well, it turns out that maple water is us northerners and Wisconsinites version of coconut water. Maple water – the un-reduced sap from the sugar maple tree, is loaded with minerals and can be used as an electrolyte drink before, during or after sports or exercise. Maple water it turns out also contains 46 naturally-occurring polyphenols, antioxidants, prebiotics, minerals and electrolytes. It also has just half the sugar as in a similar amount of coconut water, and more manganese than a cup of kale. 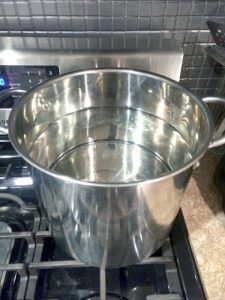 Since it doesn’t have to be reduced down from the maple sap, maple water is a lot easier to make, and really anyone with a maple tree or two can venture to do this. Tapping maples for their sap is a seasonal activity, done in the spring starting in February or March as the ground thaws and the maple trees start to come out of their winter dormancy and the sap begins to run, a period that lasts up to a month. During this sap run the maple trees draw large amounts of water and nutrients up out of the ground into the tree and branches, to put out the buds that turn into the beautiful leaves and foliage of summer, and also those clusters of little “whirly-bird” seeds from which new baby maple trees can grow. Tapping a tree is a simple process of drilling a shallow hole into the maple trunk, then using a mallet to lightly tap a small collection tube called a “spile” into the hole. Traditionally, a collection bucket is hung from the spile to hold the maple sap that drips from the spile. These buckets have to be emptied sometimes several times a day when the sap is running fastest. Modern commercial operations will often string collection pipes from the trees to a more central – and larger – collection tank. 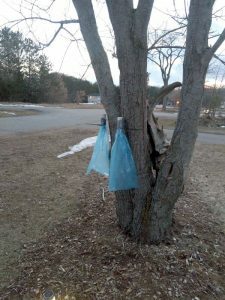 To keep our costs down, we used some plastic bags and PCV pipe to collect the sap. 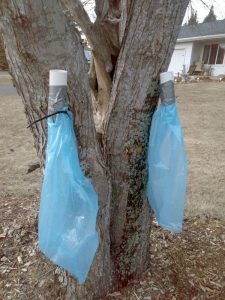 Once we had tapped our trees we were amazed at how fast we had five gallons of sap collected – about a day and a half with only about six tappers going. 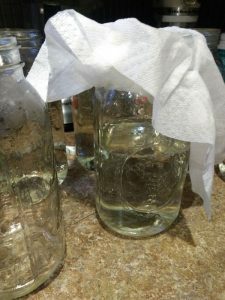 Once we collected the sap, we did a quick straining process to remove any bits of bark, leaves, or bugs that might have gotten into the collection bags. Placing the filtered maple sap into a large pot on the stove, we put the flame on high heat and waited for the sap to boil. Once the pot was at a good rapid boil, we set a time for three minutes. Unlike reducing, the short boiling process essentially just pasteurizes the sap, ensuring any bacteria or mold spores are killed off. Once the timer went off, we moved the pot off of the heat and let the sap cool. While we waited for the sap to cool down, we prepared some quart canning jars by immersing them in boiling water to sanitize them. With the maple water now cool enough so as not to crack the canning jars, we carefully poured the maple water into the prepared jars, using a fine straining mesh for good measure, to make sure we removed any of the extra fine gritty “sap sand” out of the final product. Making sure the jar rims were clean, we covered the jars tightly with canning lids. To drink, just open up one of your jars of maple water, and pour into a glass or your favorite beverage recipe! 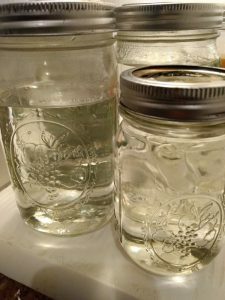 Properly jarred (canned) maple water can be kept unrefrigerated in your pantry. Once opened however, any unconsumed amount should be kept in the refrigerator. A few words to the wise: maple water is mildly sweet, but it still contains quite a lot of natural sugar – so don’t go all hog wild and drink it morning, noon and night! Sugar is still sugar, and too much in your diet is not going to be good for you. Consume in moderation! I believe pure maple sugar – in its concentrated form as a syrup or crystals – is one of the better natural sweeteners to use in cooking and food preparation. I chose to use some, either as syrup or water, in my workout drink. It has a great taste, and is something different to try. Sometimes we need just a little variety in our routines, and in our diets. Another note – if you consume maple water in large amounts (which it is very tempting to do when it is fresh, especially after the hard work of tapping, straining, boiling, and jarring it) it is possible it may make some people a little loose in the bowels. While I have not experienced that, some people do – so be fore-warned! Take it slow and let your system adapt. An ounce (shot glass) is probably a good place to start. There you have it! Maple water is a great additive for smoothies, or added to a regular glass of water for a different slightly sweet taste and lots of natural nutrients! Try some maple water “on the rocks” for a cool, refreshing summer drink. By the way, commercial maple water in the store is about $5 (or more!) for a bottle of 32 ounces, so if you have some maple trees in your yard or on your property, a few pieces of maple sugaring equipment that can be re-used for years and some canning canning jars, a little time and effort can yield a tasty and nutritious beverage for you to enjoy while saving a little coin at the same time. 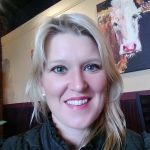 I hope you have enjoyed learning about this alternative and natural way to improve your diet and your health. May God continue to enlighten us with easy and inexpensive options for obtaining good health for a great quality of life!